New images have emerged online purporting to show the home button and vibration module for the next iteration of Apple's iPhone. The images, posted to a Japanese forum and publicized by NWE, are plain shots of detached smartphone components against a white background. 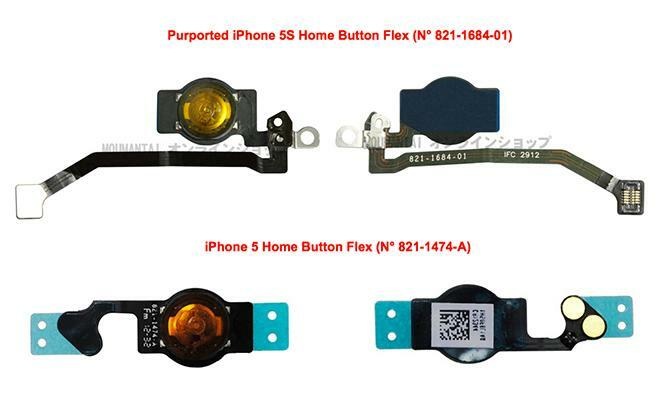 The supposed "iPhone 5S" home button bears some similarities to the home button seen in the iPhone 5, however the connectors and circuitry running from the new button are much changed from its supposed predecessor. The serial numbers shown on each of the home buttons are similar, which could indicate a higher likelihood that the pictured part is indeed from a future Apple device. Less information is available regarding the supposed vibrational unit for a so-called "iPhone 5S." The unit pictured doesn't bear any serial numbers or other identification, but it appeared on the same site as the purported home button. Friday's report notes that it is impossible to determine whether these are indeed parts from a future Apple product. The same site in January published a different set of supposed iPhone 5S and iPhone 6 parts, saying that the devices were slated for release over the next several months. While rumors and part leaks for forthcoming Apple products are nothing new, rumor mill activity has increased over the last few months, with analysts and investors expecting Apple to release one or more new iPhone models in the coming months. Among the most prevalent rumors is the possibility of a cheaper iPhone, most recently rumored to be made from plastic, with a non-Retina display and summer availability.